We believe that communications and PR (public relations) that makes an impact requires an integrated approach. What you say to your internal stakeholders should match-up with what you say to your external stakeholders. What you promote as your value proposition and brand promise has to match-up with the customer experience in real life. That's why we start with an understanding of all of your audiences and channels, then partner with you to determine the best ways to connect with them where they're reading, working, traveling and watching. There's a special something that gets unleashed when an organization aligns its marketing, communications and sales disciplines. Organizations that take the time and energy to ensure their marketing team is in sync with their sales team, and that communications is a lynch pin across both, gain clarity of message, consistency of presence and powerful brand and sales results. Sometimes you just need some good, fresh content. Because we take the time to understand your audiences and what they care about, we can develop fresh content that aligns with your brand. If you need help keeping your website, blogs, social media channels and PR initiatives fresh and engaging - we're your content marketing crew. Your website is your calling card, an opportunity to make a positive the first impression. It’s also an on-going resource that your stakeholders will reference time and time again to learn more about who you are, what you do and what you stand for. 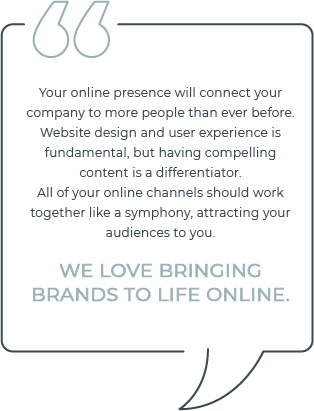 The CONNECTIVE team helps create websites that clearly reflect your company’s brand and messaging.